1. Cook the potato rösti according to pack instructions, then sprinkle each one with 20g grated Jarlsberg. Meanwhile, poach the eggs in a pan of lightly simmering water. 2. 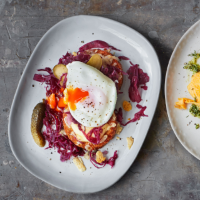 Arrange the rösti, pickled cabbage and gherkins on two plates, then top each with a poached egg and a sprinkling of ground black pepper, if liked. This recipe was first published in Sun Jan 01 15:27:13 GMT 2017.